Before the noun, vrai means quite a / elaborate / interesting. After the noun, vrai means true/real. Note that generally adjectives appear after the noun, but some very common adjectives go before. 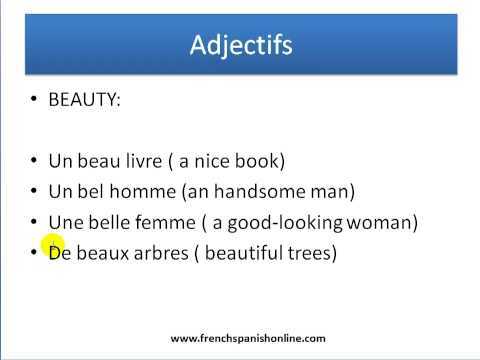 I thought the plural of "un" and "une" was " des", but the video link example says it is "de". Is that correct? Merci! Wow, I've been using "des" in front of adjectives for years. Very embarrassing. I think it would be helpful to point out in this lesson that vrai vs. faux do not behave (placement) in the same was as other opposites such as grand/petit, bon/mauvais etc. I was also referencing the lesson https://progress.lawlessfrench.com/my-languages/french/review/3002/605527 It's easy to miss the fact while faux obeys the usual rules, vrai does not. Other opposites do. I made the wrong assumption about vrai/ faux. All I was suggesting was adding this as a link to the current lesson, or noting in the lesson linked above, that vrai and faux to not behave in the same way as other opposites. I'm reading "seul sur Mars" (originally in English). The protagonist is testing that his equipment can clean air properly: "D’accord, ce n’est pas un vrai test, car je ne suis pas à l’intérieur à consommer de l’oxygène et produire du CO2". If understand this lesson properly, a better translation would be "ce n'est pas un test vrai" ? Bonjour Joakim ! First of all, well done! That's quite a challenge! As for "vrai", the nuance of position is more complicated than this. As I told you before, generally speaking, a lot of adjectives can be used either before or after the noun. Used "after", adjectives' meaning is more literal, objective or based on neutral observation (thus "vrai" meaning "true/real" in an objective manner there), whereas used "before", adjectives take on more of a subjective, figurative or based on opinion meaning ("vrai" expressing more of an opinion of something = "a real man"). So while "un test vrai" would sound very neutral, using "un vrai test" here is also perfectly acceptable, and brings a extra "value" layer to the expression: "a test worthy of that name". true story = real story? This one is a bit hard to distinguish since isn't a real story a true story? When we say it's quite a story, it means it's an elaborate, interesting story, right? Bonjour John ! We completely agreed with$your suggestions, and edited the lesson accordingly! Merci et à bientôt !